Madonna Della Seggiola (Madonna of the chair) is a painting created by Raffaello Sanzio da Urbino, known as Raphael. between 1513 and 1514. Raphael was born in Urbino Italy in 1483 and died in 1520 in Rome on his 37th birthday. 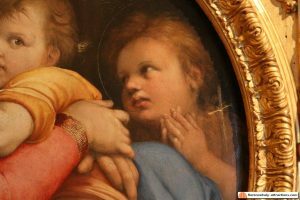 Raphael is also called Raffaello Sanzio, Raffaello Santi or Raffaello da Urbino. It’s the same magnificent painter who’s life is described in the famous Le Vite by Giorgio Vasari, which immediately places him amongst the big names of the Italian Renaissance who also inspired Raphael. The young painter was greatly influenced by Leonardo Da Vinci and some by Michelangelo. 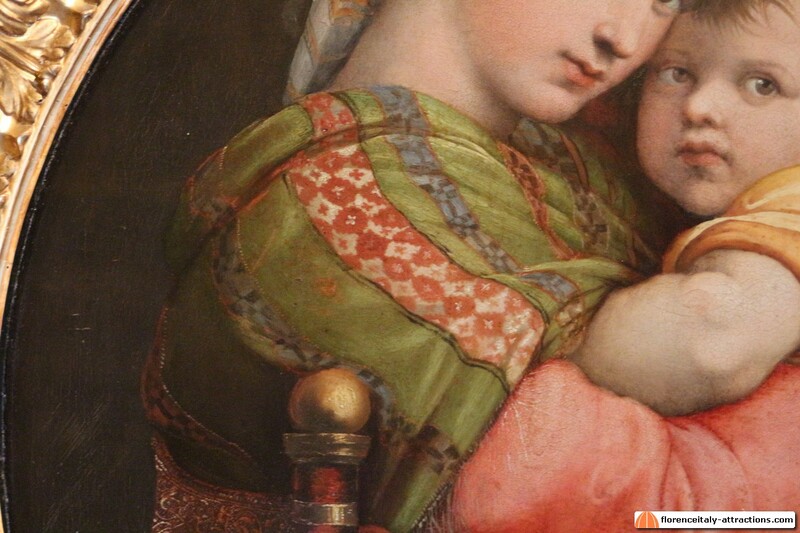 Find out more about the short life of Raphael. 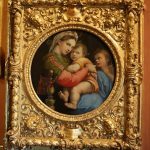 The Madonna Della Seggiola is a mature painting by Raphael that you can see in the Palatine Gallery of Pitti Palace in Florence Italy. The work, also known as Madonna Della Sedia, owes his name (literally: Madonna of the chair) to the fact Mary is sitting on a chair. 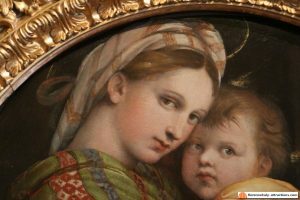 The origin of the Madonna Della Seggiola painting is uncertain. 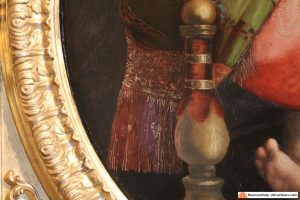 It might be a painting made for Pope Leo X of the Medici family, mentioned in an inventory of the Uffizi made in 1589, or be a painting for the Dukes of Urbino that came to Florence as part of the dowry of Vittoria Della Rovere when she Married Ferdinando II Grand-Duke of Tuscany. The painting has been at the Uffizi until 1799, when it was stolen, among many other works, by the troops of Napoleon invading Italy. Madonna Della Seggiola luckily came back and was then moved to the Pitti Palace. The iconography of the Madonna Della Seggiola is original, not compliant to the tradition. Mary is generally sitting on a throne or a pillow, or even on the ground, but never on a chair. It’s, by the way, an elegant chair with a purple seatback decorated with gold and fringes. Also unusual is the clothing, with a multicolor shawl and a striped fabric covering the head of the woman. 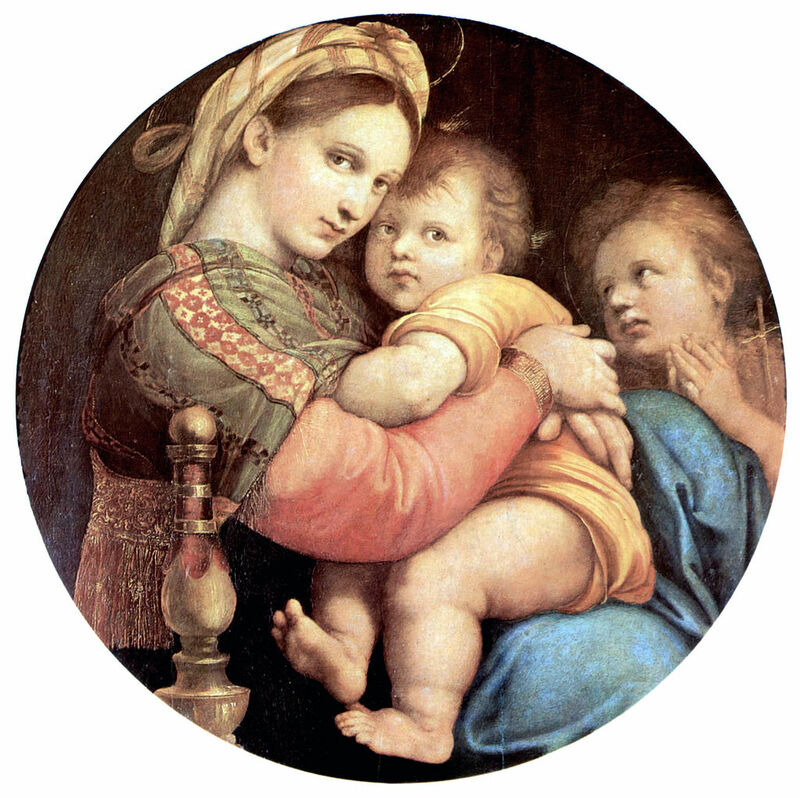 These unusual facts fueled legends about the painting: one states that Raphael made a “street portrait” to the daughter of a wine seller with her sons,right on the top of a barrel (hence the shape of the painting), someone else thinks that the clothing of Mary is the same worn by the secret lover of Raphael, Fornarina, a common woman in Rome. In the Madonna Della Seggiola painting, we see Mary holding the baby Christ while John the Baptist watches them. This painting does not have the strict geometrical shapes and linear style that Raphael used in his earlier work but has warmer colors and more feeling to it: the way John the Baptist watches how Mary embraces her child is a symbol of homage to maternity for many. Mary bending forward her head suggests a sort of oscillating movement in the act of cradling Jesus. 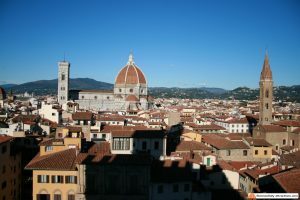 It is a good example of what was written by Vasari about the works of Raphael: works of other painters are called paintings, works of Raphael really come to life. Some find the work by Raphael ‘too realistic’, clearly the Madonna with a chair is approaching perfectionism. 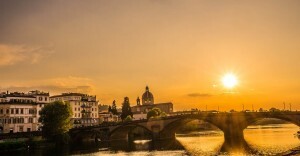 The Madonna della seggiola by Raphael is a masterpiece of Renaissance painting in Florence Italy. The article describes the painting and its history, along with legends and stories linked to the work. 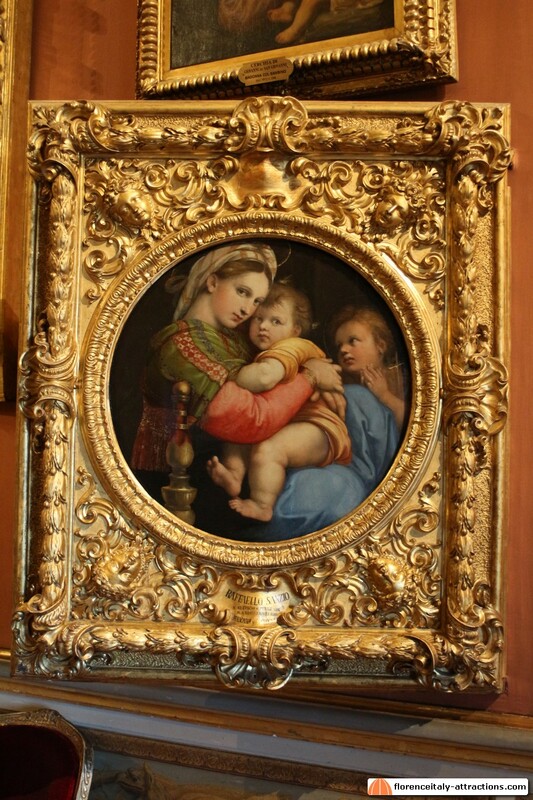 I was curious if you’re aware of reproductions of the frame surrounding the Madonna della segiola. I know the original was in a late 17th century Baroque spandrel frame, but do many reproductions exist in THE united states today? Any info would be much appreciated!